I still find it astounding to think, that one day I was ‘me’ and literally the second my first baby was born, I was never the same again (or, after my second and third babies). My 28 year-old-self would’ve been very skeptical if someone had told me this - ‘I’m only having a baby, how much can I change?’ Well, a lot, yes? The same can be said for all big changes in life, right? A bereavement, marital breakup, job change or, serious illness, even a house move. Truly though, when I became a mother, that was by far the biggest shift for me and continues to shape me day by day. I've accepted this gift now but the loss of 'myself' was quite profound for some years - it felt like I was mourning my 'previous life' for the longest time. 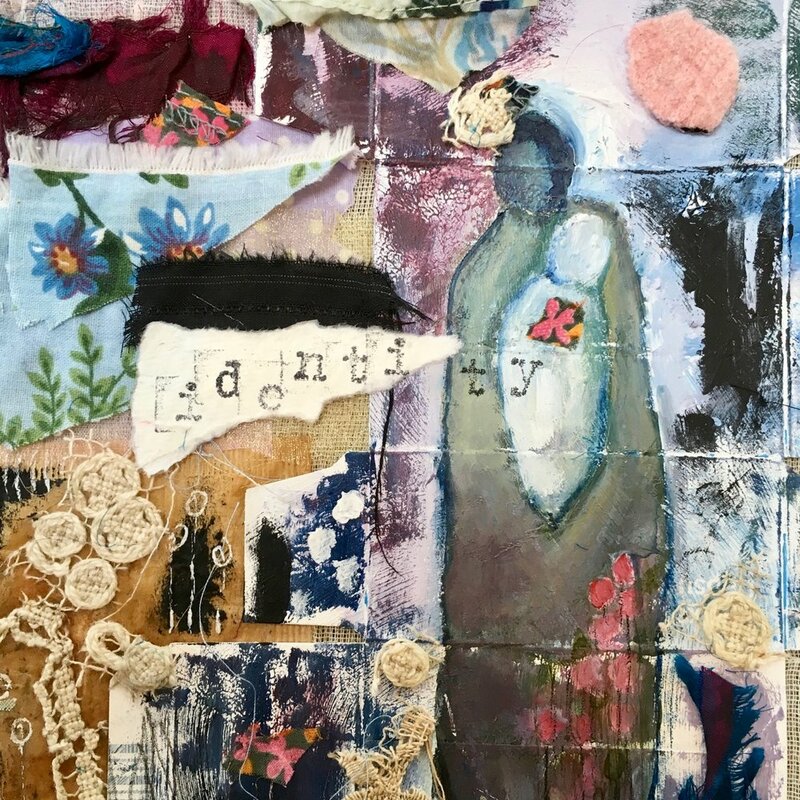 I chatted about this topic here and now again today because it’s showed up in my latest collage - called (you guessed it) Identity. It features the female form holding an infant baby. The figure is of a darker colour than the newborn because she’s holding a brand new, pristine life in her arms ie. the baby that she’s carried in her body for nine months but she’s also lived a life herself prior to baby. She’s weary for now; she’s been changed - she’s ‘older’ somehow. Around her are flowers - they’re part of her everyday and their beauty refreshes her and reminds her that life is the same, it’s just her experience of it that has changed. Everything is as it should be - the sun rises and sets and the stars are held above us, as always. She’ll never be the same but she’s also softer, more malleable and kinder somehow. She’s felt and seen things that have made her mark both physically and spiritually and she can't and wouldn't want to go back. The one and only, Brene Brown writes about 'Motherhood Shame' here in a brilliant pdf relating to her book, 'I Thought It Was Just Me'. While I'm sharing, here are some other truly inspiring and noteworthy downloads that are free via Brene's site. As with all my previous headsup50project collages, this work is focusing on depression, my journey and the bigger 'picture' of mental health awareness and stigma. You'll see in these collages that there is glorious imperfection, no neat edges with an accompanying deep love, appreciation and an inner knowing that I am many facets, not only a mother, a wife and daughter - I hope you feel this too when you look at this series of collages. In A Rut - HeadsUp50 6/50 Collage - Expecting Change But It's Not Happening?